Losing weight by melting ice makes sense from a physics standpoint. 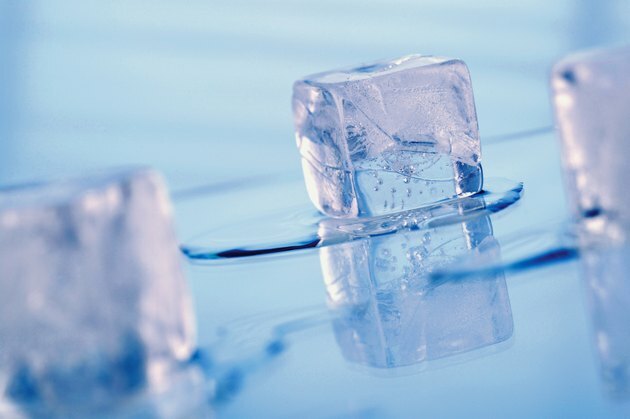 Oregon-based physicist William Butler reports that it takes approximately one calorie to bring one ounce of ice to body temperature. Unfortunately, at that rate it would take more than 200 pounds of ice to burn off one pound of fat. However, ice and ice water can help curb your appetite as well as providing a nominal calorie burn. You can use this by itself, or combine it with a more aggressive weight loss program. Use crushed ice, either alone or in water, when melting ice for weight loss. You can swallow crushed ice without chewing it. Chewing ice can break fillings or even crack teeth. Consume a glass of ice about half an hour before each meal. According to research reported at CNNHealth.com, people who take in water before a meal eat 75 calories less per sitting. This can add up to over 14 pounds worth of weight loss in just one year. Drink ice water, or swallow some crushed ice, as your first response to a hunger craving between meals. According to celebrity personal trainer Bill Phillips, this will fill your stomach with a zero-calorie liquid rather than a snack. Take in at least eight glasses of water daily. According to WeightLossForAll.com, drinking adequate water will speed your metabolism by about 3 percent. This means you'll burn more calories in every activity, even sleeping or watching TV. For best results, combine melting ice with a program of diet and exercise. Does Eating Ice Help You Lose Weight?